It’s no secret that I LOVE me some soosh. Nothing makes me happier than a few of my favorite rolls, some Pinot Grigio and a TON of extra ginger. As a sushi fanatic, I've had my fair share of sushi around Philadelphia over the years, so I've rounded up my favorite spots in the city so you can enjoy them as much as I have! Fat Salmon is a sweet little spot in center city that is great for a romantic night out. But be warned, once your food comes out, you are going to be a lot less focused on your loved one and totally obsessed with this amazing sushi. Fat Salmon definitely gives you your money's worth too; one of the first things we noticed was how BIG the sushi rolls were. Fat Salmon really does live up to its name. The Spicy Scallop rolls were the best I've ever had, and I highly recommend the incredibly tasty Lost Rainbow Roll, made with Spicy Crab, Scallion and Masago on top and Tuna, Salmon, and White fish with Ikura sauce in the middle. Umai Umai is probably Philadelphia's best-kept secret. A tiny place right up the street from our house in Fairmount, this unassuming little spot has hands-down the best sushi I've ever eaten. I'm not exaggerating when I say that after the first time I ate here, my boyfriend and I literally thought about it every night for a week, until we made a reservation for the following Friday! Speaking of reservations, make them early! They fill up quickly because they are such a small place and so damn delicious! I usually call on a Tuesday or Wednesday for Friday and Saturday reservation and they typically only have 5:30 or 9:30pm available for dinner. We go late, but if you want to attend during normal dinner hours (between 6:30-8pm) I recommend calling 1.5-2 weeks in advance. I highly recommend ordering a few of their "Designer Rolls" like the strawberry-topped Godzilla roll or the Spartan tenderloin roll ($10-$14 each). Their classic rolls like the spicy scallop and shrimp tempura are just as delicious but a bit more affordable ($7-$10) each. The cherry on top, or should I say sashimi on top, is that this place is also BYOB - meaning you won't rack up a big bill ordering drinks. The service has always been absolutely perfect, and the moment that long plate of sushi comes out, you'll know exactly why we gave the food 6 out of 5 stars! Pod is an awesome spot in University City that makes for an unforgettable experience. The vibe is super unique featuring neon lights, a futuristic/space-age interior, and cozy capsule seating for parties of 4 or 5+. The sushi is incredible - I didn't try a single roll I didn't savor - but the real star of the show was their cocktail menu, specifically the White Bubble-Tea with Rum which tastes so amazing I had to order two. It was just one of the dozens of signature drinks featured on their menu. I absolutely recommend Pod for anyone looking for a unique sushi experience or a new, interesting cocktail! My boyfriend and I always end up at Double Knot to celebrate anniversaries, promotions, and even a few belated birthdays... The atmosphere is breathtaking, and when you walk downstairs to the main dining area you are immediately immersed in the experience. 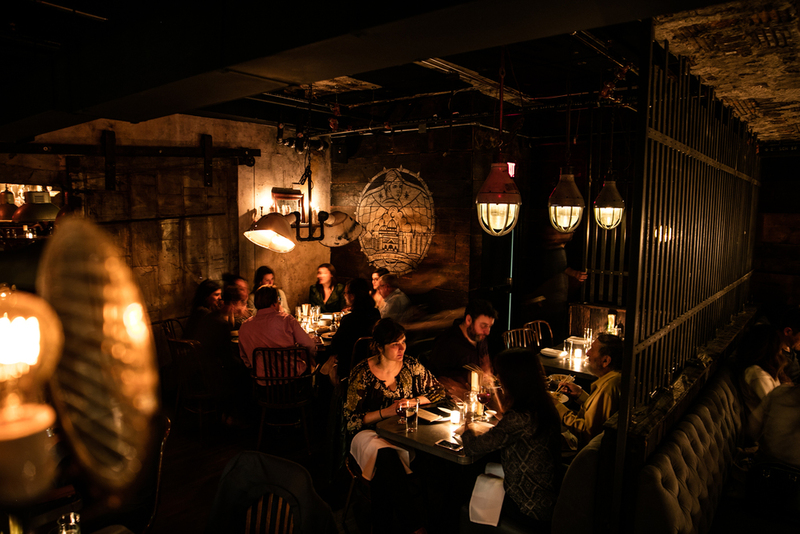 The interior design features a dark, moody lighting with hundreds of candles that sit on top of wax drippings that look like they've accumulated over 20 years. This is definitely the place to go if your goal is to get lost in the moment with your sweetheart or have a super intimate gathering with friends. The sushi here is fantastic, but their extensive appetizer menu is the real draw. The apps come in small plates, usually between $2 and $6 that have a couple pieces on them each, and they are so. freakin'. good. They are brought to the table as they are made, so we usually order about 3 or 4 to warm me up before my sushi comes out. Lastly, their drink menu is full of brilliantly crafted signature cocktails, including the "Double Knot" and my personal fave, "the Lover's Knot," made with Vodka, Yuzu, Cucumber, Cherry Blossom, and Bubbles. Either way, you can't go wrong picking a cocktail from their menu. Lastly, I couldn't complete this list without my go-to delivery spot. Rain or shine, Machi Sushi has their incredible deals delivered to our door on an almost weekly basis and we absolutely love it. You're probably thinking you read that price wrong... but you didn't, it has be the best deal in the city! We almost always keep it simple with the shrimp tempura and salmon-avocado rolls, and we are still amazed at the quality we get for that price. At this point, my boyfriend and I have invested in our own chopsticks, sushi plates, and soy sauce bowls so that whenever we order take-out or delivery, we set up in our living room with some Netflix and get that restaurant-feel right here at home with our kittens! So these are my go-to sushi spots in Philly. If you live in the area or are visiting, give them a try and let us know if they lived up to our hype!